MIDI, from its humble beginnings in the music industry, has become one of the most robust and consistently implemented control protocols, with JLCooper playing a significant part in its early development. But MIDI has been hamstrung by its restriction to cable runs of less than 20 metres. 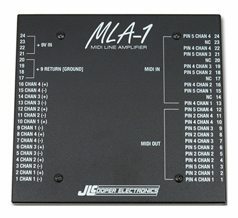 The MLA (MIDI Line Amplifier) Series of interfaces now allows MIDI signals to be securely transmitted for over 300m in many different locations and applications, including theatres, live music venues, touring PA systems, schools, broadcast and production facilities, multi-room music studios, film and TV studios, convention centres, amusement parks, visitor centres, hotels, churches and industrial or business premises. The MLA series converts the MIDI signal to a high speed balanced digital format that can be transmitted over CAT 5/6 twisted-pair, microphone or multi-core cable and returned to the MIDI standard at the destination.